Size: approx. 15-20 mm. Photo: 08/07/12, noon. The Grapeleaf Skeletonizer (Harrisina americana) has narrow, completely black wings which it holds spread out and away from body at rest. 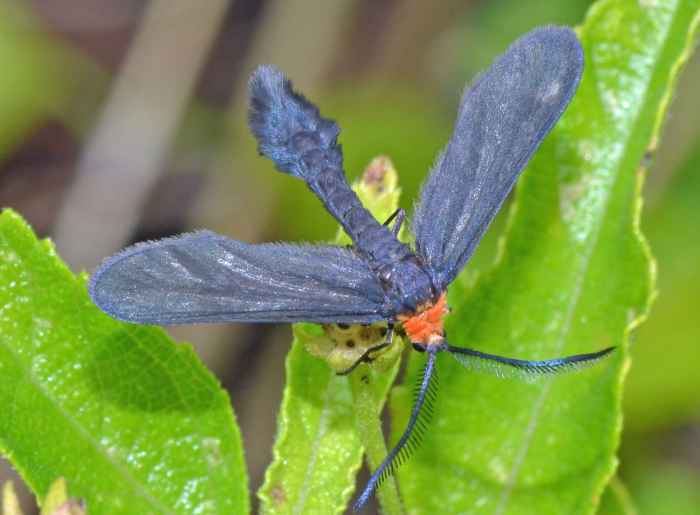 Its collar is orange/red and the tip of the abdomen has prominent tufts of scales. Their larvae feed on grapeleafs, redbud, and virginia creeper. We definitely have the latter, unpleasant plant in our yard. Anyway, a beautiful moth.